Winemaker’s Notes: This is a cava that is complex on the nose, offering the primary aromas of the grapes. When you taste the Vilarnau Brut Reserva we want you to be reminded that it is made from fruit, in this instance from Macabeo, Parallada, and Xarel-lo grapes. It is very fresh and fruity and we recommend drinking it as an aperitif before a meal or at any time of day. My Review: Alright, before we get into the wine, what I thought of it, how it tasted and all that stuff, we’ve really got to spend some time talking about the bottle. 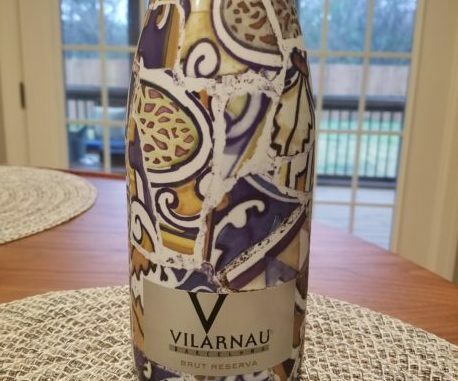 The bottle is designed to honor the Catalan roots of the cava house, which is why it’s wrapped in the avant-garde imagery of Antoni Gaudi. I absolutely love this bottle design (and the rose’ that I also got, but that one’s still to be consumed). There’s as much art on the outside as on the inside (and yes, I consider winemaking an art form). I really struggled with throwing out this bottle after my wife and I drank it, and it’s giving me serious thoughts about starting a second site that just talks about labels and bottle designs that I love, regardless of what’s in the bottle – it’s the creative in me coming out (I work with a lot of designers). Alright, but on to the wine that was in this awesome bottle. The wine itself was golden in color, and on the nose I picked up aromas of apple and yeasty, bread notes. In the mouth the wine had smaller bubbles (which I tend to prefer), and flavors of flint, stone, and mineral layered over soft apple notes. I’m unfamiliar with all of the grapes that make up this cava, but I have to say that I enjoyed it. My wife and I took the advice of the winemaker and opened it on a Saturday afternoon while we relaxed at home, but I think sharing with friends before dinner or with some creamy goat cheese would have been a good pairing too (especially the friends part. Always drink wine with friends when you can.). For $15 I really like this wine and would definitely buy again. It’s a good value for an enjoyable cava that’s as much art on the outside as the inside. If you decorate your house or kitchen with interesting food and wine decor, it’s worth the fifteen bucks for that alone.